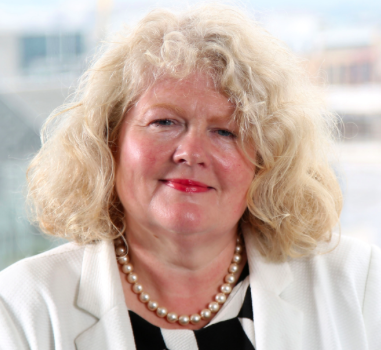 Farm Week Column 25 October – Michele Shirlow Chief Executive | Food NI - Our Food So Good! Our dynamic food and drink industry, especially smaller companies, made quite an impact in the strategically important marketplace in Great Britain last week. Our companies came out on top in a host of prestigious awards. First, Cookie Jar from Newcastle won the Irish Wheaten Bread category in the influential World Bread Awards at a gala event in London. We are delighted with Cookie Jar’s success this year – it was runner-up in 2017 – in a category we encouraged the organisers to include last year. We saw a great opportunity to showcase Northern Ireland’s historic expertise in soda breads using a simple mixture of flour, baking soda, salt, buttermilk. Wheaten, of course, is sometimes known as brown soda and has long been popular across the region. Northern Ireland has retained a strong and dynamic base of home bakeries, and we were keen to showcase this in Britain particularly through the promotion of soda breads, among the most traditional of our bakery products. We were supported by Andrews Ingredients in Lisburn, a major supplier of flour and other ingredients to bakers here, in Britain and the Republic of Ireland. Our support for bakers has included arranging delivery of products to the judging panel in Britain. In addition to Cookie Jar, other local bakeries successful in the category were Ann’s Pantry in Larne, runner-up, and third placed Deli-Lites from Warrenpoint. Ann’s Pantry also gained two silver medals for its products. Deli-Lites, a specialist in food-on-the-go, has a very successful bakery, Past Tense. And Yellow Door in Portadown was also runner-up in the Showstopper category which celebrates the ‘best and most creative bread using a Tiptree product as an ingredient’. Yellow Door gained the listing for its novel Banofee Brioche bread. The company, headed by top chef Simon Dougan, also won two bronze medals for its Horny Bull brown soda and beetroot loaf. Secondly, there was more good news too for Broighter Gold Rapeseed Oil from Limavady. The farm-based business run by Richard and Leona Kane gained a silver medal in the British Farming Awards 2018 for innovation in farm diversification. The British Farming Awards celebrate the creative thinking, innovation and dedication of the UK’s farmers. Broighter Gold, managed by Leona, was the only finalist from Northern Ireland. We’d love to see many more entries in next year’s awards because of the profile that success in the competition generates. And thirdly, Jawbox, a local producer of small batch gins, was also shortlisted in this year’s Quality Drink Awards, a competition that’s closely monitored by foodservice and catering operators in Britain and usually produces worthwhile new business leads. Five companies, furthermore, were shortlisted in the produce awards organised by Great British Foods, one of the UK’s most influential ‘foodie’ magazines. The successful enterprises were Ballylisk Triple Cream Cheese of Tandragee, Broighter Gold Rapeseed Oil of Limavady, Warrenpoint’s Deli-Lites, Glenballyeamon Eggs from Ballycastle and Comber’s Mash Direct. And in the Irish Quality Food and Drink Awards in Dublin seven of our members were successful – Dale Farm, Clandeboye Estate Yoghurt, Deli-Lites, Echlinville Distillery, Golden Popcorn, Linden Foods, Niche Drinks and White’s Oats. A further success was Noel Allen of Noisy Nuts being named by The Grocer among the New Talent of 2018. We are delighted to see some many of our smaller companies now achieving such recognition in Britain. More companies than ever before are entering awards in Britain and benchmarking their products and processes against competitors there.